This year’s Hall of Fame winners for containing the highest levels of deleterious pesticides had a new candidate move into the Top Three position: Kale. After washing the produce as it would be in a consumer’s kitchen, the Environmental Working Group (EWG) tests detected residue from at least two or more pesticides on more than 92 percent of kale samples, some of which held residue from up to 18 pesticides. Dacthal, a chemical compound banned in Europe for a decade, was found on nearly 60 percent of the kale samples. 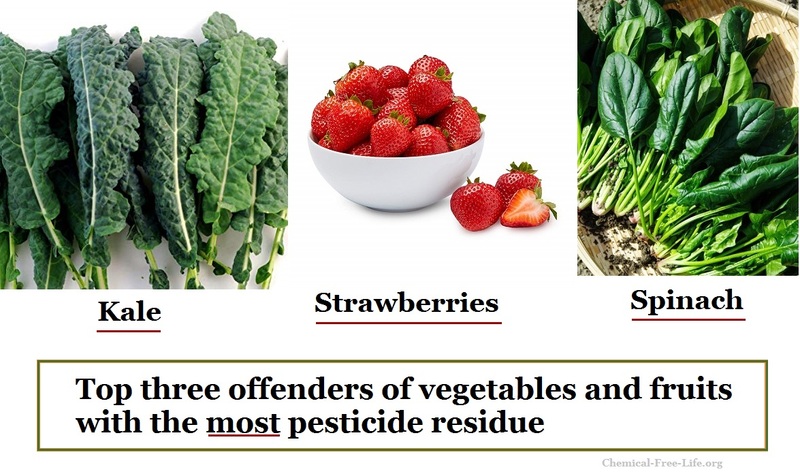 The 2019 Dirty Dozen list places the top three offenders of vegetables and fruits with the most pesticide residue as: Strawberries, Spinach and Kale. For those of you who may be new to the chemical-free movement, the Dirty Dozen list is released each year by the EWG. The nonprofit consumer advocacy organization uses more than 40,000 produce samples tested by the Food and Drug Administration and the U.S. Department of Agriculture in compiling its list. Other produce on the 2019 Dirty Dozen List: In addition to kale, more than 90 percent of the strawberries, apples, cherries, spinach and nectarines tested positive for two or more types of pesticides, with grapes, peaches, pears, tomatoes, celery and potatoes completing the EWG’s list. Solution: Eat organic versions of these fruits and vegetables whenever possible. When that is not possible be sure to thoroughly wash your produce to remove as much of the pesticide residue as you can. Also see the Clean Fifteen list of produce with the lowest levels of pesticide residue, including avocados, sweet corn, pineapple and frozen sweet peas.